Gum, coins, Lego, batteries; infants and young children will eat the strangest things. Most small toys will pass through a child’s digestive system within days, but the button batteries that you get in cameras, toys or watches cause horrific internal burns if they become trapped in the oesophagus or stomach. If you have one in your body, you really want to get that out as soon as possible – their electric current produces hydroxide. 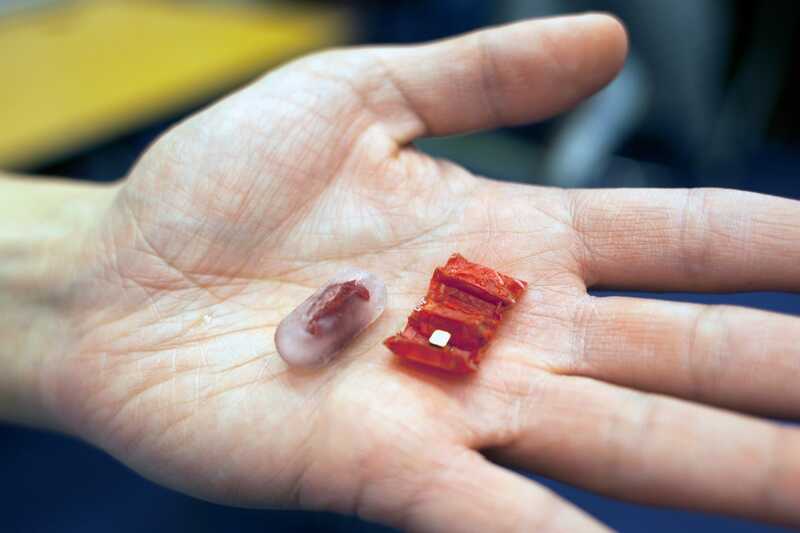 The robot can unfold itself from a swallowed capsule and, steered by external magnetic fields, crawl across the stomach wall to remove a swallowed button battery or patch a wound. Made of a type of dried pig intestine usually used in sausage casings, the capsule is guided through the body by external magnetic fields. Within is a robot that compresses enough to fit inside and strong enough to fully unfold when the capsule dissolves. The robot propels itself using what’s called a ‘stick-slip’ motion, in which its appendages stick to a surface through friction when it executes a move, but slip free again when its body flexes to change its weight distribution. Because the stomach is filled with fluids, the robot doesn’t rely entirely on this – 20 percent of the forward motion is by propelling water. It also had to be possible to compress the robot enough that it could fit inside a capsule for swallowing – through trial and error, the researchers arrived at a rectangular robot with accordion folds perpendicular to its long axis and pinched corners that act as points of traction. “It’s really exciting to see our small origami robots doing something with potential important applications to health care,” says project leader Daniela Rus, who also directs MIT’s CSAIL. “For applications inside the body, we need a small, controllable, untethered robot system. It’s really difficult to control and place a robot inside the body if the robot is attached to a tether. Highly creative and practical, this sophisticated origami robot addresses a clinical need in an elegant way. Watch it unfold and remove the button battery stuck to wall of simulated stomach made from silicon rubber with a mixture of water and lemon juice simulating acidic fluids. Tags: Automation, Biotechnology, Drugs, Hygiene, Medicine, Robotics, Robots, Soft robotics.